The ludicrously stacked UFC Middleweight Division gives us another terrific title fight this weekend as the UFC travels to the Rod Laver Arena in Melbourne. Two of the Middleweight division’s most entertaining strikers will slug it out in the main event as champion Robert Whittaker aims to settle his Ultimate Fighter rivalry with Kelvin Gastelum. In the co-main event Australia’s own Israel Adesanya challenges the legendary Anderson Silva followed by Bantamweight fight between top grapplers Rani Yahya and Ricky Simon. 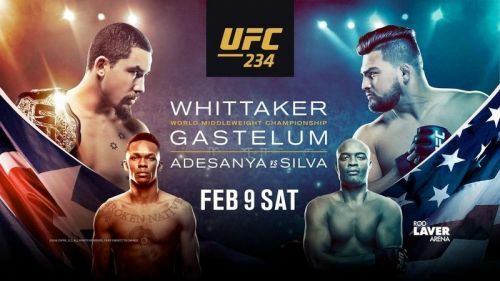 Following a season coaching against each other on The Ultimate Fighter, middleweight champion Robert Whittaker will finally clash with Kelvin Gastelum in the UFC 234 main event. Since moving up to 185 pounds, Robert Whittaker has been phenomenal and undefeated. With eight straight wins, including victories over Yoel Romero, Ronaldo “Jacare” Souza and Derek Brunson, Whittaker is a devastating striker with knockout power in every limb. Along with amazing striking power, he has also shown incredible takedown defence while going up against some elite wrestlers in his career. The biggest question mark will be on the health of Robert Whittaker, who sustained heavy injuries in his last two fights against Yoel Romero. Kelvin Gastelum comes into the title fight with a 5-1 record with one no contest, including a stunning knockout against former champion Michael Bisping. Much like Whittaker, Gastelum is a former Welterweight who has looked even better at Middleweight while showcasing a deadly boxing game that may be the best in the division. The fight against Whittaker, a justifiably highly-regarded champion, gives Gastelum the opportunity to put together a performance to remember and if Gastelum can consistently outmanoeuvre Whittaker, one would be hard-pressed to deny his status as the best middleweight on the planet. This fight could be a first-round knockout or a five-round war, and that’s what makes it such an intriguing matchup between champion and challenger. The surging middleweight contender takes on the division’s former long-time ruler in the co-main event of UFC 234. Israel Adesanya comes into this fight with a perfect 15-0 record, four of those wins coming in the UFC, including a brutal first-round finish of Derek Brunson last November. Israel Adesanya is a former kickboxer with excellent technique and dynamic range of weapons on his feet make him explosive and unpredictable. The Nigerian born New Zealander is a must-watch fighter these days and is arguably the best in the sport when it comes to using his legs and knees. The only concern for Adesanya is that he’s shown little to no ground game, as he’s all stand up striking. This co-main event can be viewed as the past versus the future, but Silva isn’t about to pass the torch to Adesanya with a potential title shot on the line for the winner. You can catch these fights in India Live and Exclusive on SONY ESPN and SONY ESPN HD channels on February 10, 2019, at 8.30 am (IST). UFC 234: What's next for Israel Adesanya?